He who would study Karate-Do must always strive to be inwardly humble and outwardly gentle. However, once he has decided to stand up for the cause of justice, then he must have the courage expressed in the saying, "Even if it must be ten million foes, I go!" Thus, he is like the green bamboo stalk: hollow (kara) inside, straight, and with knots, that is, unselfish, gentle, and moderate.. " Gichin Funakoshi. World Class Karate continues to teach and practice his method. The only control one can exercise... is control over oneself. Sun April 14 in Vaughan. Click here for info. May 4 at Vaughan dojo by Saeki Sensei. May 19 at in Montreal. More info to follow. July 11 - 14 in Ottawa. Click here for more info. 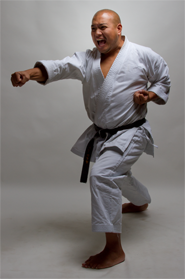 Aug 29 - Sept 1 in Montreal featuring JKA Chief Instructor Ueki Sensei and 2 other JKA HQ instructors. Classes will be held at the Vaughan dojo and are limited to 1 or 2 persons. The schedule will be made between the individual and the instructor. The times are restricted to Mon-Fri 8am-4pm, Sat & Sun after 1:30pm. 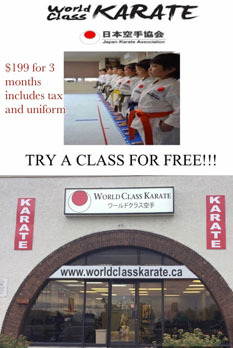 Please contact Sensei Ed (edleung@worldclasskarate.ca) or Sensei Ray (raytio@worldclasskarate.ca) for rates.